There’s no better way to celebrate Christmas than with fudge. 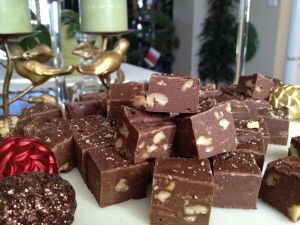 It seems fudge makes its grand appearance around the holidays. Perhaps because it’s so rich and decadent it’s sinful to indulge any other time of the year unless your on summer vacation and you’re in a tourist area. For some reason there always seems to be a fudge confectioner around these areas. . . My mother-in-law makes fudge every Christmas and only at Christmas, I guess that’s another reason why I think of fudge as special occasion candy. I rarely buy it unless I happen to run across a unique fudge, like the time I was in Big Sky, Montana and came across Huckleberry fudge – Sold! If you haven’t tasted huckleberries, there’s nothing else like it! 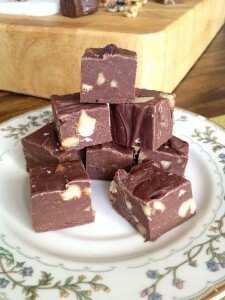 This year I thought I’d experiment with easy fudge making. 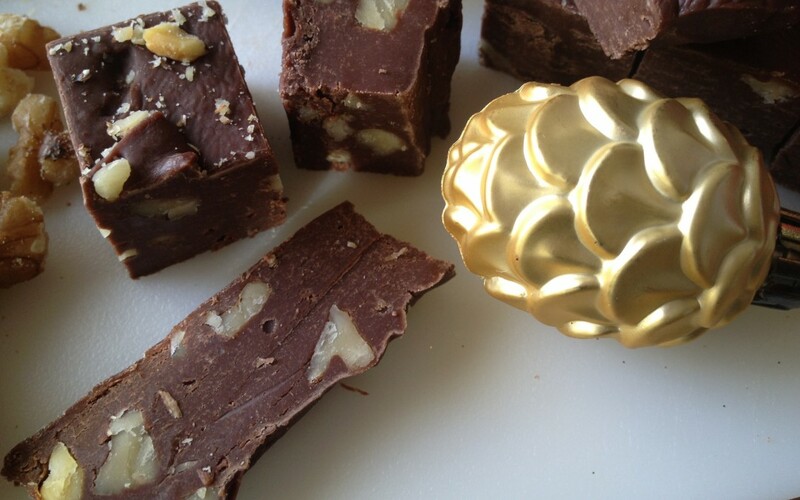 Alton Brown says this is not fudge, but a “fudge-like” candy. Okay, it doesn’t have all the cooking and stirring, but it’s still “fudge-y” and it’s still good. I was inspired to make this easy four ingredient fudge from and episode of the Pioneer Woman. Rhee made her peppermint fudge with semi-sweet chocolate chips. I made her fudge recipe but without the peppermint, and it was very good. Then I made the same recipe with a good brand of milk chocolate chips. It was okay, a little flat tasting, not what I expecting. I liked the semi-sweet fudge better. 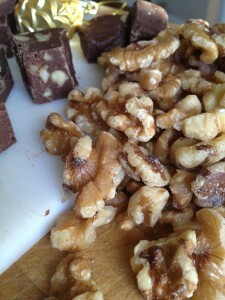 So I combined the two chocolates, added vanilla extra and toasted walnuts to the recipe. Of course, you can add any type of nuts, fruit or candy you prefer. I really liked the semi-sweet and milk chocolate chocolate combination. 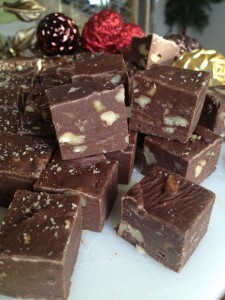 The fudge isn’t too sweet and the toasted walnuts add crunch and flavor. (Any time you use nuts in a recipe they should be toasted to enhance their flavor). I liked this recipe so much that it’s my homemade Christmas gift this year. I filled (and lined with waxed tissue) a few glass containers, boxes and a couple of tin containers and tied them with red ribbon. 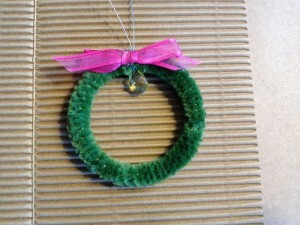 For a finishing touch, I added a velvety handmade made wreath ornament (they also doubled as my Christmas cards) made out of pipe cleaners and a binder ring as an added little gift. Enjoy! Step 1 Line an 8-inch square baking pan with foil. Lightly butter the foil or spray with cooking spray. Step 2 In a medium saucepan over low heat, combine the chocolate chips and sweetened condensed milk and stir until it's all melted and smooth. Do not over heat. Step 3 Pour chocolate mixture into the prepared pan and spread evenly. Refrigerate for 2 hours. Step 4 After the fudge has set, lift the foil out of the pan and remove foil from the fudge. 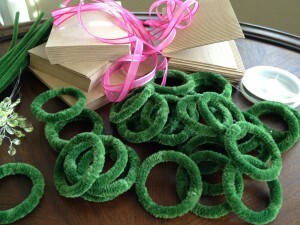 Cut into small squares, or desired shapes.